Stephen Colbert uses secret super PAC funds to donate to a campaign finance reform group. In his long, fruitless, strangely not-Emmy-winning battle for campaign finance transparency, Stephen Colbert has relied on the work of former FEC commissioner Trevor Potter and his Campaign Legal Center. In December, Cobert bestowed the CLC with a portrait of himself holding the FEC ruling that their work had earned him. 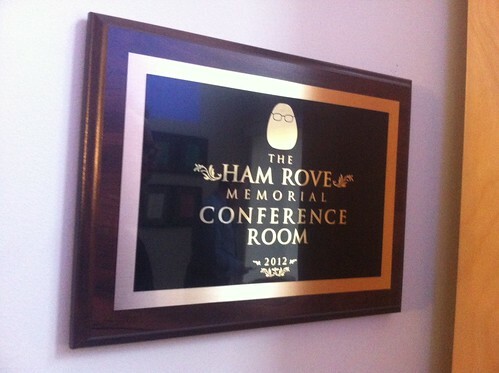 Last night, the CLC held a small reception to show off the rest of the TV host’s gift: A donation and a plaque, renaming the organization’s conference room after Colbert’s faux, murdered adviser Ham Rove.